Prue practises and teaches Saori (pronounced Sour-ri), a Japanese freestyle form of weaving. 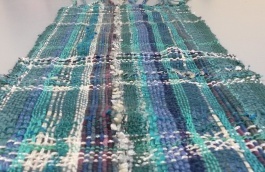 The word derives from two Japanese words: "Sai" meaning uniqueness and "ori" meaning weaving. "I love immersing myself in Saori weaving. The freestyle nature of the craft allows you to relax in your creativity, a freedom from the fear of 'making mistakes', as everything that you do in the piece provides its eventual character and uniqueness. Saori allows the weaver to discover more about themselves, capture a moment in time through tangible textiles and enjoy a form of moving meditation all at once! What's more is that it's something that EVERYONE can do, regardless of age or ability and that's why I love teaching the craft to others."